It was dark and we were rocking together in the brown leather recliner that has become the staple of our nighttime routine. It was far past his bedtime but we were all still giddy with the freshness and memories of the weekend. We had read our books and now it was time for my favorite part, the part where he drifts off while talking to me, holding my hand or bringing me in for kiss after kiss to prolong his bedtime. But on this night there was something else - his grin. It was the kind of grin where I could see all of his teeth and the kind that made me grin right back at him. Over and over he recapped his weekend to me, excitedly telling me about his favorite parts. He met Muddy the Mud Hen! He went to a baseball game! 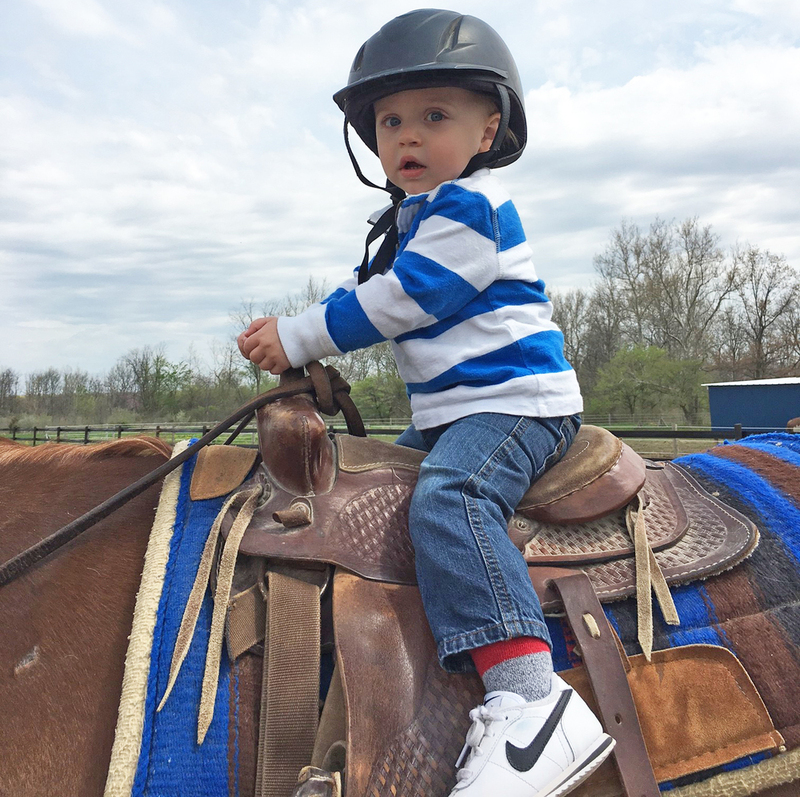 He rode a horse! He played with the kids! We had both spent the weekend smiling and now we were reveling in the memories. We were standing in the shaded barn petting the horses and coaxing him into the thought of riding one, though we doubted we'd have much success. "Jillian is going to ride a horse, do you want to ride one like Jillian?" "No!" His response was clear. Until the horse came out of their stalls, walking into the openness that would take the children on individual rides around and around in laps. The brown coats and long black hair caught his attention. His cousin Jillian getting onto a horse caught his attention and soon it was all he could talk about. "I ride, too?" It became all we could do to keep him calm, letting him know his time would come and that he had to take turns. He was mesmerized as they trotted around and even more so as we took the horses out into the sunshine. "I ride, too? I ride, too?" Over and over, until at last, the time came for him to ride, too. We walked over to the giant horse, strapped on his helmet and they helped him up onto the horse. There was no fear. He gripped on tightly to the reins, looked at me, and then looked out at the pasture. He was ready, and in my heart of hearts, I knew that as soon as I stepped away from the horse, he would begin to cry. But he didn't. He simply looked down at the young girls holding tight to the horse and off they went. Around and around in laps until it was time to let someone else have a turn. And that's when the dam broke. That's when the tears came. Because after all, he wanted to ride, too. We walk into the stadium with Henry clutching me tightly. His senses on full alert, looking around at this new experience. People everywhere, kids laughing, a voice on the loudspeaker. And that's when we spotted him. Muddy the Mud Hen, scooting through the crowd, honking his toy horn as people gathered and waved. A giant yellow bird, different than Big Bird whom he knew from television, but similar still. He glanced once, then twice, and the third time, the grin. Muddy waved. Henry grinned bigger. He held out his tiny hand and Muddy gave him a high five. And Henry's little life was made. It was the coolest of the cool. Later we sat in our seats, right in the front, over in left field. He ran back and forth between us, he read books, he played with the ball we had just purchased, he ate a box of popcorn, he made friends with the older woman next to us, he did everything except watch the game. And then Muddy came. Right behind him, and then right next to him. Muddy came to deliver a card to the family next to us but on his way, he took the time to stop, wave, high five, and pat the head of his newest little fan. Henry's smile was wider than I've ever seen it. This was his movie star, and he had taken the time to acknowledge him. At the end of the game, mothers and their children were invited to run the bases together. We walked onto the dirt field, held hands, and off we went. Pausing briefly to slap the hands of Muddonna (Muddy's female counterpart), Muddy, and to step on each base as we went around. Henry squealed and panted as if he had never had more fun in his life. This was his moment - out on the baseball field, holding the hand of his Mommy, and running and playing. He was so happy. That toothy grin is exactly the reason why we do it. The exhaustion and expense that comes with taking a child out, whether it's to a private birthday party, or a public baseball game. It all comes with expense - monetary and emotional. It comes with stress and frustration and "please just listen to me"'s. But at the end of the day when you're rocking in the brown leather recliner, and that mile-wide grin, the fast, broken speech and the hand squeezes make an appearance, that's when you remember that you'd do it all over again if only to hear his recaps, if only to see the smile. It's the reason that parents do these things over and over again. Because those memories that you're forming are all worth it.